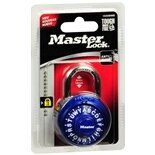 Shop Master Lock Key Padlock (1 ea. )1 ea. 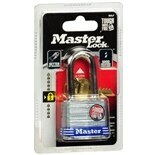 Shop Master Lock Padlock (4 ea. )4 ea. 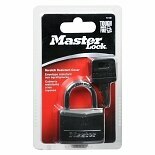 Shop Master Lock Padlock (1 ea. )1 ea. Even though you may always try to see the best in people, it's impossible to know when someone might try to steal your valuable possessions, so it's essential that you keep certain items locked up. 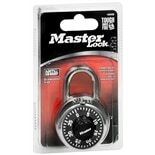 Master Lock has been one of the most trusted brands of padlocks in the country for almost a century, and the company's selection of keyed and combination locks are designed with the utmost security in mind. 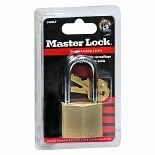 You can find a wide selection of Master Locks here at Walgreens. 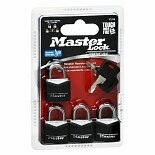 You can choose among a wide range of product types when browsing Master Lock padlocks. Though keyed padlocks date back about 2,000 years, these products have been vastly improved upon in recent generations to help them stay secure, and a variety of anti-picking mechanisms make it exceptionally difficult for thieves to break in. The major potential downside of keyed locks is that it will be much harder to access your possessions if you lose the key. Combination locks replace physical keys with a series of numbers, letters, or motions that you need to memorize if you want to open the lock. Multiple-dial locks have several dials that need to be spun to the correct numbers for the mechanism to open, while single-dial locks rely on your ability to spin the face of the lock in the correct pattern. 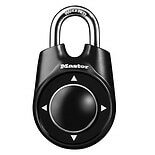 The most recent Master Lock innovations actually allow you to set your own combination on a single-dial lock. Like keyed padlocks, the internal mechanisms in combination locks are constantly being redesigned to thwart potential thieves. Founded in 1921 by experienced traveling locksmith Harry Soref, Master Lock quickly established itself as one of the most trustworthy padlock manufacturers in the country. The company was granted a patent for creating the first laminated steel padlock just a few years after it was founded. Master Lock continued innovating with the creation of its first combination locks in the 1940s and '50s--which featured the same design still used today. 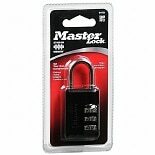 Through the years, Master Lock products have been trusted by the military, the Secret Service, and countless prisons, in addition to everyday consumers interested in protecting their valuable possessions. The company's headquarters are located just outside Milwaukee.